Media News – DC Comics Fans Across the Globe Set New World Record ! You are here: Home » Trending Now » DC Comics Fans Across the Globe Set New World Record ! DC Comics Fans Across the Globe Set New World Record ! 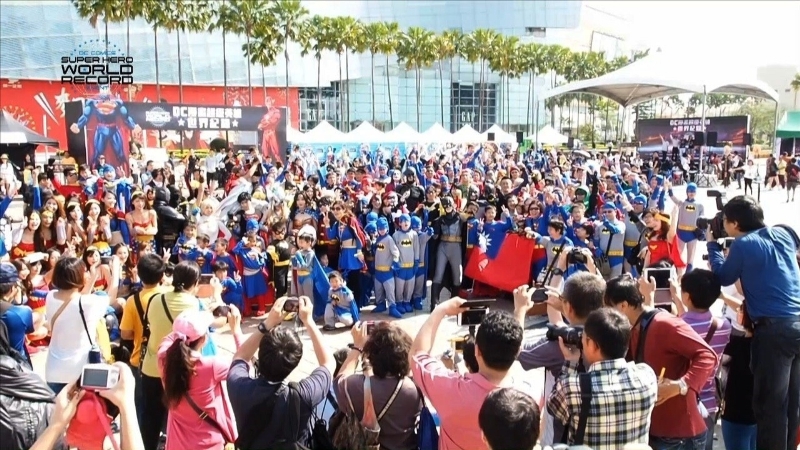 Warner Bros. Consumer Products (WBCP) and DC Entertainment (DCE) today hosted fans around the world to set a Guinness World Record for the largest gathering of people dressed as DC Comics Super Heroes. In a 24-hour period, thousands of fans gathered around the globe to participate in the DC Comics Super Hero World Record Event by donning their favorite costumes inspired by DC Comics’ pantheon of Super Heroes, including Batman, Superman, Wonder Woman, The Flash, Green Lantern, Batgirl, Supergirl, Aquaman, Cyborg, Robin, Green Arrow and many more. “Thanks to all the fans of DC Comics Super Heroes around the world who joined us to set a world record—a record that celebrates the power and appeal of these iconic characters,” said Brad Globe, President of Warner Bros. Consumer Products. The DC Comics Super Hero World Record Event kicked off on April 18, 2015 in Queensland, Australia, and came to a commemorative close in Los Angeles, CA, USA. Within the same 24-hour period, additional events took place around the world in: Manila, Philippines; Kaohsiung, Taiwan; Madrid, Spain; Rome, Italy; London, Birmingham, Warrington and Cardiff in the UK; Sao Paulo, Brazil; Paris, France “Smallville,” USA (Plano, IL) and Mexico City, Mexico. Fans are highlighting their participation in the heroic event using #DCWorldRecord on Facebook and Twitter. The official Guinness World Record count will be available in the coming days.